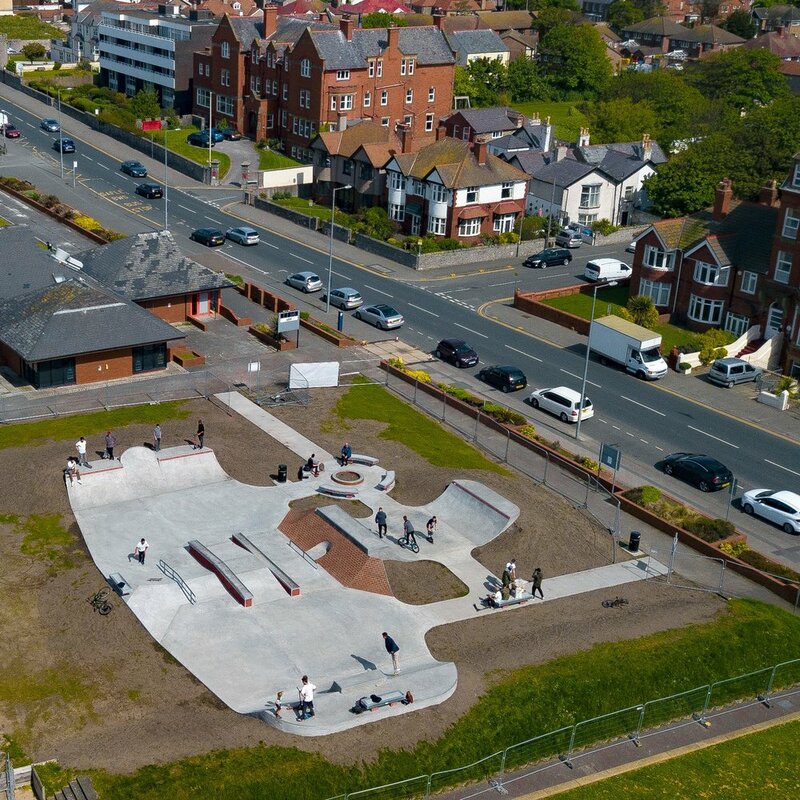 The main skatepark area is an open-plan 'street course' style set-up, with open sight lines, plenty of space between features, and simple lines, to make it a safe and functional space even when very busy and accommodating users of mixed ages and abilities. One end has wide flat bank with a quarter pipe extension in the centre and a generous standing space with a seating area for rest and/or supervision/spectators. The opposite end is the reverse, a wide quarter pipe with a 'half penny'-style flat bank extension in the centre. Within the central space of the park is a combination of street style units which offer an array of potential for technical tricks. On the south side is a hipped brick bank transition. The platform of the half pipe interfaces with this feature to form a curb/ledge on top of the bank. The 'mouse hole' in the centre can be carved over, adding to the experience, whilst protecting users from taking a line into the rail which sits alongside. To the North of the brick bank and flat-bar/rail is a long, knee-high ledge/curb, with tubular coping on its grinding edge, making it more appealing to a wide range of users, particularly inline skaters. Beyond the ledge is a driveway with a long, sloping 'housetop' ledge on one side. The other side of this ledge can be accessed from the 'bank-to-bank', which also houses a sloping rail before opening up into a large, in-line pyramid hip on the Northern edge. On top of the hip is a flat ledge. This area is highly functional and offers many transfers and lines, with the potential to be used in a linear fashion, or in a circuit. Whilst relatively simple, there are endless potential ways to interpret the space subjectively. It is a fantastic training arena for street-style riding/skating, with great provision for progressing onto more technical tricks. We have used red brick imprint styling to tie in the aesthetic with the architecture of it's surroundings and have balanced the sensitivity of the design, and softening effect of the bunding/landscaping, with a strong visual impact, creating an attractive and fitting addition to a popular leisure area.